Three essential components are required simultaneously for a disease to occur: a virulent pathogen, a susceptible host and a favourable environment. A favourable environment includes all abiotic factors, such as moisture (e.g. air humidity, rainfall and irrigation), temperature, sunlight, wind, nutrition and soil quality, as well as biotic factors, such as beneficial microorganisms and/or predators that might interfere with the pathogen or the plant. 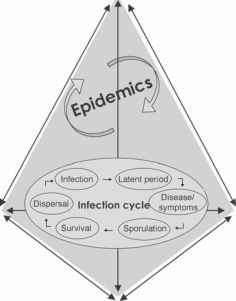 The relationship between the three essential components of a disease - pathogen, host and environment, often referred to as the 'disease triangle' -determines the outcome of that disease. Pathogens and pests are very dependent on environmental conditions for disease development (Fig. 4.1). They often exist at low levels, but erupt into epidemics under favourable conditions. Fig. 4.1. The complex interactive epidemic tetrahedron illustrating the multiple interactions between the three components of the 'disease triangle', the environment, the pest/pathogen and the host plant, and the effect over time of the evolutionary forces on living populations leading to new diseases and pest epidemics. The various components of the environment may interact differently on each step of the infection cycle. intensity occur in a host population over time and space. The two essential forces driving epidemics are the presence of host and plant populations, and the dynamic processes governing plant-pathogen interactions. Disease infection cycles are characterized by a series of steps, including inoculum survival, infection, latency period, production of new propagules and dispersal, leading to a secondary cycle or survival depending on the mono-or polycyclic nature of epidemics. Each of these steps is influenced by specific environmental requirements which, in turn, could be affected by climate change. Therefore, any long-term or specific extraordinary atmospheric event modifying the phyllosphere or rhizosphere, including the introduction of abiotic stress, would significantly modify the interaction between the components of the 'disease triangle'. 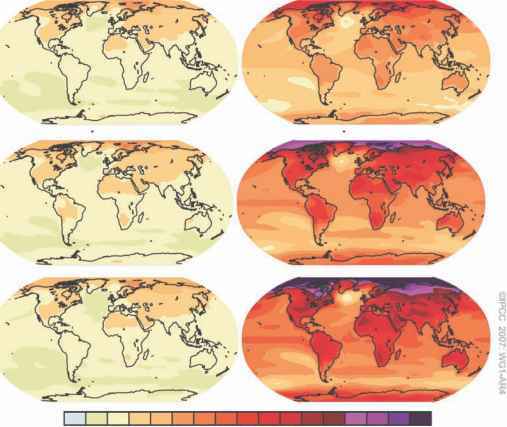 With climate change, there will probably be increases in some diseases but decreases in others. The changes are subtle, and they can be positive or negative or even have a neutral impact on individual pathosystems because of the specific nature of the interaction of host and pathogen (Coakley et al., 1999). A few examples here illustrate the effect of these factors on disease cycle components such as survival, the infection and colonization process, latency period, and production and dispersal of inoculum (Table 4.1).